Baby Brands Direct stocks the highest quality oral hygiene and care products for baby and kids. Retailers can stock from our selection that ensures clean and healthy teeth and gums. Oral hygiene is extremely important and it starts as early as the child is born. With years of expertise, we have realised the importance of providing practical and high quality oral care solutions for retailers. That is why our strictly organised portfolio features brushes from reputable and award-winning brands such as: Philips, MAM and NUK. Those world renowned brands connote quality and innovation. For instance MAM’s brushes are made from special, extra soft material ideal to clean teeth and sensitive gums. 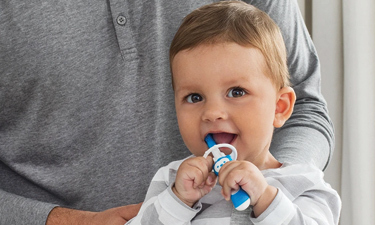 NUK’s toothbrush has a protective guard with an easy grip handle and it is entirely BPA free. Philips’s brushes feature Snap-on design for simple brush head replacement. To find out more about the products key attributes follow their descriptions, that you can also use for your own business purposes. The baby products are one of the most innovative products and industries on a global scale. Hygiene, BPA free, Non-toxic, are all key attributes to the most in demand baby products. Parents are very well informed, very wary of safety and practicality; parents are ever demanding and expect value against every product. Retailers should not worry about delivering against those perquisites. Baby Brands Direct is the favourite business to business wholesaler, who collaborates with industry's experts and essentially the industry innovators. That is why our oral hygiene and care selection features ergonomic and most sought-after designs. With flexible ordering and global shipping services, retailers can swiftly stock on the latest items.